Four exhausted children have been discovered cowering in a house next to the bodies of their mothers by staff of the International Committee of the Red Cross, which today accused the Israeli military of "unacceptable" delays in allowing medics safe access to injured Gazans. The Red Cross had been asking the Israeli military to allow them access to Zeitoun since Israel’s ground invasion began on Saturday, but only a three-hour lull in the fighting on Wednesday allowed them to make the dangerous journey. The Red Cross said Israel had breached international humanitarian law by not allowing access to the wounded and said it "considers the delay in allowing rescue services access unacceptable". The mounting criticism of Israel’s operation comes as the UN, which gives food and aid to around 750,000 Gazans, announced it was suspending all its aid work in the Gaza strip after its staff and compounds came under attack by the Israeli military. Two drivers in a clearly marked UN convoy were killed today by an Israeli tank shell. 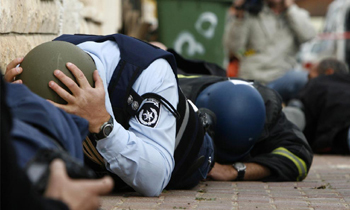 The Israeli military has attacked two UN schools, killing more than 46 Palestinians who were sheltering inside. Another 35 bodies were pulled from the rubble in several areas across Gaza City today during a three-hour lull in the fighting. The Palestinian death toll after nearly two weeks of Israeli bombing, shelling and ground combat now stands at close to 750, with around 3,000 injured, and the figure is rising rapidly as more buried bodies are uncovered. John Ging, UNRWA’s director of operations in Gaza, said that the decision to suspend activities was "really heartbreaking. This is a very, very difficult decision for us to make as the population here is in a dreadful state and really needs our help." Ging said the accumulation of incidents meant that the UN had "lost confidence in the mechanism that’s there. We are perfectly prepared to take the reasonable risks in this conflict zone but something has to change. The verbal assurances have run out in terms of credibility." One Israeli soldier was killed today, bringing the death toll on the Israeli side to 11, three of whom were civilians. 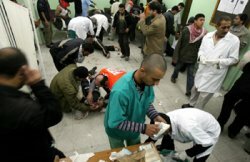 As the conflict deepens, striking evidence from Red Cross medics and from Palestinian witnesses has revealed that one of the worst incidents of civilian killings during Israel’s offensive happened when several homes in Zeitoun, southeast of Gaza City, were shelled by Israeli tanks, leaving dozens dead. The area had been surrounded by large earth walls dug by Israeli troops, making it impossible to bring in ambulances. Medics yesterday took out 18 wounded and 12 others who were exhausted on the back of a donkey cart. More wounded were believed to be still sheltering in houses nearby. Under international humanitarian law both the Israeli military and Palestinian armed groups must do everything possible to search for, collect and evacuate the wounded, the Red Cross said. Attacks on medical staff, hospitals and vehicles were prohibited. However, more than 20 medical staff have already been killed in Gaza by the Israeli military. 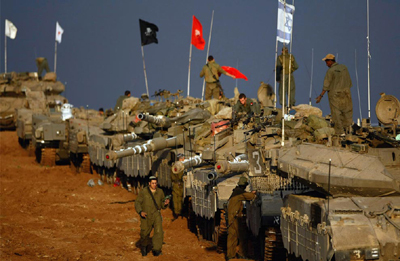 In a written response the Israeli military did not address the detailed criticisms but said Hamas, the Islamist movement that controls Gaza, "deliberately used Palestinian civilians as human shields." It said it would investigate any serious allegations about the military’s conduct. Israeli air strikes destroyed several houses in the town of Rafah, on Gaza’s southern border, after leaflets were dropped warning residents to leave the area which said: "Hamas uses your houses to hide and smuggle military weapons." Around 5,000 Palestinians fled their homes and took refuge in two UN schools that had been set up as shelters. As the fighting continued today, there seemed little willingness on the Israeli side to halt the massive military operation. The Israeli prime minister, Ehud Olmert, travelled to the military’s Gaza division headquarters and said there was still more fighting to come. He said the "bottom line" was for "quiet" to prevail in southern Israel. "To this we have not yet arrived and the IDF has not yet been asked to carry out everything necessary in order to do so; the decision is still before us," he said. For the first time in the conflict, the violence stretched to northern Israel, where four rockets were fired from southern Lebanon into the town of Nahariya, injuring two people at a nursing home. A small Palestinian faction was believed to be behind the attack, but it did not appear to herald a regional escalation of the conflict.